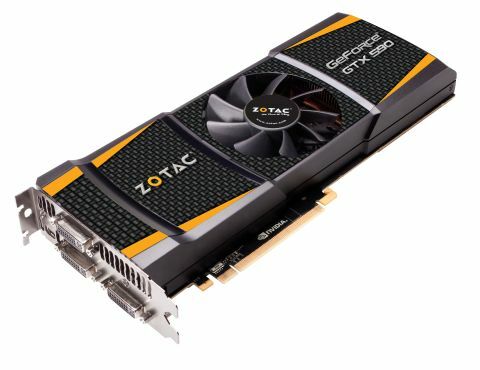 Can Zotac's take on Nvidia's latest win the top graphics card crown? At the very least Nvidia has given people pause for thought when they consider what is the most powerful graphics card around today. Unfortunately, though, Nvidia cannot lay claim to the fastest graphics card mantle unfettered, as I'm sure they would have preferred. It's slightly disappointing that with this Zotac GeForce GTX 590 it couldn't have pushed the performance past what we've already seen in the AMD Radeon HD 6990. The fact is Nvidia has created a card that to all intents and purposes performs almost identically for a little bit more money. We fully expected the Nvidia card to beat the AMD dual-GPU monster hands down. After all, its engineers will have had time with the Radeon HD 6990 to see what it could do and would have thought they might have been able to tweak its card to beat it. It's possible that's what Nvidia was trying to do by holding the launch or any previews back until the AMD card had been launched, but was unable to get the drivers working to a stage where it could comfortably sail past the HD 6990. We didn't see a card until about two weeks after they were in the country due to the drivers not being finalised yet, and to me that smacks of optimisation. An early source also informed us of a far higher MSRP, closer to the £700 mark, before we got hands on with the board. Whether that really was a clerical error, or whether Nvidia genuinely believed it might be able to sell the card for that, may never actually be known. So mildly underwhelmed would be a good assessment then. Which has surprised me given that I was, possibly unfairly, expecting performance beyond the realms of what I'd seen before. Especially for the cash. This month I've played with two different graphics cards, one at £550 and one at nigh-on £600, and an £800 processor in the shape of the Intel Core i7 990X Extreme Edition. And I'm fairly confident I've still heard the words 'global economic crisis' used in the present tense recently. Has nobody told the technology world that people can't afford this? But then these aren't products for the consumer. These are components that companies use as tech-demos to show what is possible. The sad thing for both this Zotac GeForce GTX 590 and the AMD Radeon HD 6990 is that far more commercially viable, and effective, setups are available. As we mentioned the Radeon HD 6970 in CrossFire is the same price as the HD 6990 and cheaper than an Nvidia GTX 590, and yet outperforms both. With the fact that anybody with a motherboard less than three years old will probably be able to run two AMD graphics cards in their machine, PSU willing, that's looking like a world-beating setup. Add in the fact that certain Radeon HD 6950s can be unlocked to function like HD 6970s, for a good deal cheaper, and it really is a no-brainer as to where the smart graphics money gets spent. For all that though Zotac's Nvidia GeForce GTX 590 does represent some impressive technological engineering. Being able to run two GF 110 GPUs on a single PCB without melting a hole in the side of your chassis is impressive. As is the fact that it actually runs quieter and cooler than the competing AMD HD 6990 too. It's a much more elegant solution too, being nearly an inch shorter than the competition and a little thinner too. Unfortunately they do both still generate a lot of heat and the symmetrical design means a great deal of warm air is being pushed back into your case as well. So decent airflow is a must, but also a lot trickier to create with the turbulence the GTX 590's fan will create. But for us it's all about performance and Zotac's Nvidia GeForce GTX 590 just doesn't have the wow-factor to really justify that huge outlay. We were hoping for something a bit more special, and, to be honest, we're a little disappointed. Mounting two of its top-end Fermi GPUs onto a single slab of PCB, and still being able to get it running without a meltdown is impressive. As is the noise. It's by no means a silent card – you'll definitely know it's there – but it's nowhere near as bad as a twin GTX 580 setup. It's also a very elegantly-designed card too. It's only a tad longer than a single-GPU GTX 580, and significantly smaller than the Radeon HD 6990. Sadly our big problem is the performance. It's still a very fast card, but given that Nvidia waited until the competition was out we expected the GTX 590 to take the speed crown, even if it was only by a small margin. What's happened is that each company has its own benchmark wins and no across-the-board winner. We're also a little unsure about the symmetrical design. We appreciate the need to cool both chips equally, but blowing so much hot air back into the case is not going to do good things for the rest of your components. So in the end we have a very fast card, as fast as AMD's very fast card. But is there really a place for such a beast in the world today?